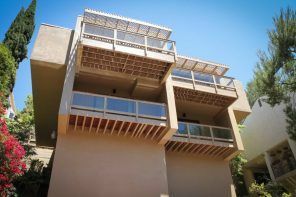 Loft-style design is characterized by large spaces with an emphasis of the industrialism – use of open communication and design features of premises as a kind of decor, the simplification of all segments of life, sleep and rest. A neutral palette, use of the entire spectrum of colors from white to black, the introduction of natural shades to soften the industrial nuances. But in this article, we won`t deepen into the principles of Loft style. 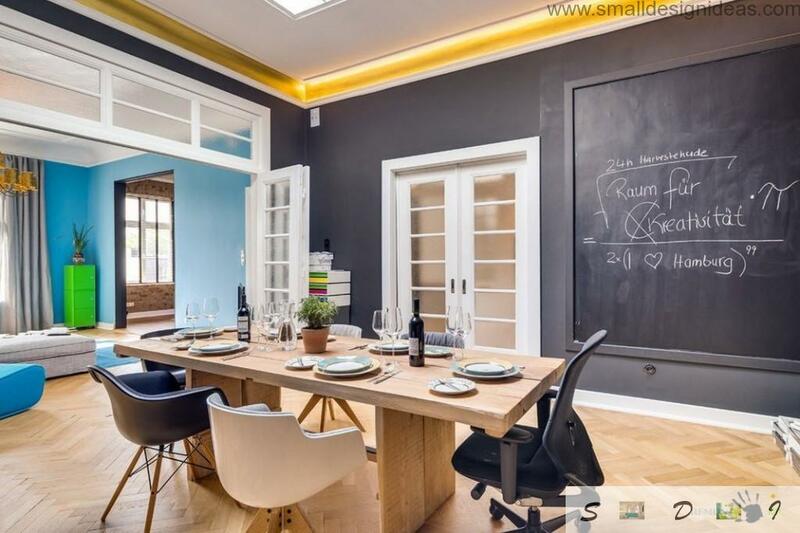 We would like to introduce you the loft German apartment interior decorating ideas as an example of how bright, colorful, technological, and even outrageous loft can be. Despite the fact that the basic principles of the use of loft-style have been complied: large-size facilities with high ceilings, large windows and wide doorways are decorated simply and concisely, you can feel how other stylistic tendencies such as pop art and eclectic were influenced on the overall design. Traditionally we`ll begin our tour with a central room in the apartment – the living room. Corresponding to loft style thematic, room furnished in minimalistic way, there is very much of space, almost the entire decor has functional implication. But in the same time common family room is incredibly colorful. It amazes with color palette choice and the way of decoration. Typically, the brick walls become accents in the living room interior, but in this case, with a combination of bright white ceiling and blue walls, neutral shades of brickwork became a backdrop for a very colorful artwork. 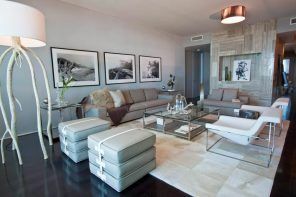 The modular system of upholstered furniture, consisting of pieces upholstered in various shades of gray, has formed a spacious relaxation area of the living room. Original design of tables, stands, made in the form of white honeycomb, coupled in chaotic way, have been complemented the external image of relaxation area. The lighting system is represented by a large golden chandelier with dual inline lampshades and snow-white floor lamp, which together with the bright blue chair have been created a reading corner. In the premises, drawn up in a loft style, often there are no partitions and walls between different zones. In the case of this German apartment, all rooms are separated, many equipped with interior doors. But doorways are so wide, decorated with inlays of frosted glass, making them airy that the space doesn`t look fenced, air flows freely goes from room to room and create the effect of a large space. The living room is the passage to two other rooms – dining room and kitchen. Let’s look first at the original dining room and examine it carefully. The dining room is decorated fairly contrasting – dark walls go perfectly with white decorated doorways and ceiling with golden cornice is shining thanks to lights. Flooring is continued by living room decoration – light wood parquet. Dining group is represented by capacious rectangular table made of wood and chairs with upholstered seats, decorated in shades of gray. Another way out of the living room leads into the kitchen area. Despite the impressive space of the premises, the household who are in the kitchen, able to communicate with those who are located in the living room, the parameters of the impressive doorway provide such an opportunity. The kitchen impresses with its extent of no less than the other rooms. The decoration of utilitarian space was dividing to the walls, painted in white tone and masonry as a way to design vertical surfaces. Using a brick wall as decoration of kitchen splashback may be practical, and not only original way of finishing, if to process the surface with an additional layer of waterproof antiseptic and protective lacquer. This spacious room was a place for the impressive size of corner layout kitchen units. The combination of yellow and gray facade shades of the kitchen cupboards creates not only a variety of color palettes in the kitchen, but also shapes the character of the room. Bigger part of the kitchen center occupies a spacious island with integrated appliances and storage systems. On one side of the kitchen island was erected a special rack and putted a bar stools of original design for the organization of space for breakfast and other fast meals. Using wood surfaces with minimal processing allows you to add warmth of home comfort, so necessary for a spacious room with the elements in the industrial finishing. 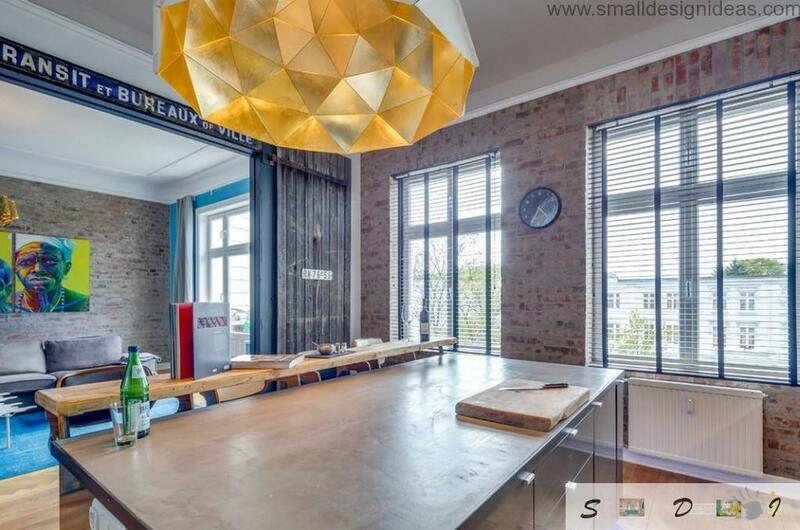 Rounding out the image of a bright and original kitchen a large hanging chandelier, made in the constructivist style. 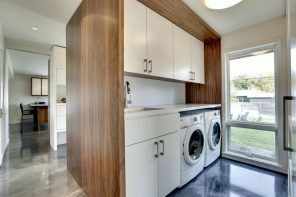 Its interior design echoes with the shades of kitchen units. 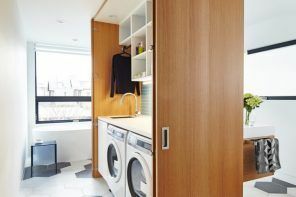 Instead of the usual double doors to kitchen facilities, decorated in the style of a loft, a design decision was made about setting the simulation of the wooden gates, which are mounted on heavy metal rods, alike the street design. This unusual and even daring touch in modern interior added personality, zest of the loft German apartment interior decorating ideas. Then we move into private rooms of the owners, and will visit the master bedroom first. Its method of furniture decorating somewhat departs from the traditional style of loft design solutions. An original way to design the walls of the bedroom was a combination of brick masonry with wallpaper, copper embossed of which is exactly the same as some shades of brick. The resulting harmonious alliance looks like it was specially created for the presence in a common room for sleep and rest. On brick wall background bright art work looks great. 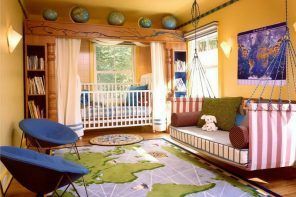 Together with a colorful bright lemon-colored chair it has been diluted the gray-ocher bedroom palette. 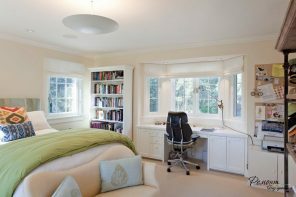 The original design of space around the bed to create a whole ensemble, which is not only pleasant to relax, but you can comfortably work at a laptop with a cup of coffee. Through the use of common materials execution of all elements of the sleeping area, the whole ensemble looks not just as a whole, but as a complex first of all, which parts cannot be imagined without one another. Bedroom storage is presented in the form of roomy, four-door cabinet with a niche in the center of the structure. With such a massive piece of furniture the need for a separate dressing room is eliminated. Next to the master bedroom the bathroom is located. 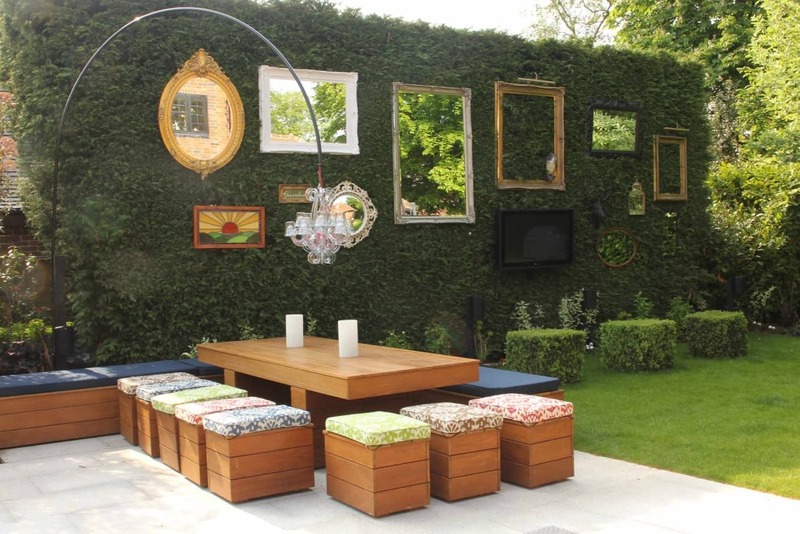 It`s made no less eclectic in decoration. 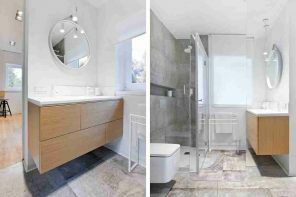 On the surfaces of the bathroom you can find almost all possible options of finishing the room with high humidity – mosaic tiles, masonry, painting and pasting of water-resistant wallpaper. Of course, the surfaces exposed to the bigger moisture, are lined by a ceramic tile mosaic light shade. 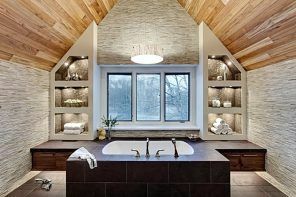 The original design of space around the sink was the highlight of the bathroom interior. And not only in masonry, which has become a way to design an splashback over a sink, not only the mirror, but, first of all, the use of specially aged wooden for tabletops execution. 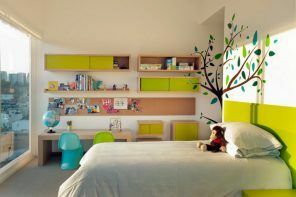 Another bedroom is capable to provide a minimum of three teenage children with comfortable beds, located in an interesting two-tier furniture complex, made deliberately of aged wood. Against the background of bright finish of almost all room surfaces, not only items of furniture, but the original decor, designer pendant chandelier are clearly visible. Here are the TV-area and a place to study and work. Using the storage system represented by metal lockers with partially peeling paint, have added a unique atmosphere even more creative. In the space under one of the beds arranged original resting place – a cozy corner where you can sit down to read a book or just chat. 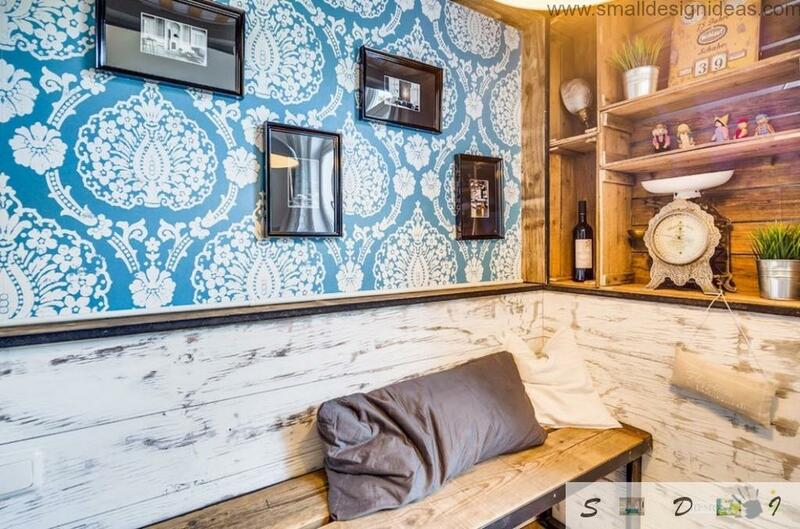 Using the white-blue wallpaper with a colorful ornament for decoration of one of the walls, it has brought not only the variety of colors in the cavern environment, but also gave it more optimism and positive. Near the bedroom with a bunk bed there is a bathroom, but with a more modest and neutral finish. For a small asymmetric room white decoration was the most appropriate option, it was possible to slightly diversify it with the help of ceramic tiles in pastel tones. 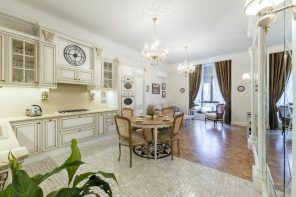 Against the background of the white walls the original design and the texture of stone sink and wooden countertops is very clearly distinguished. 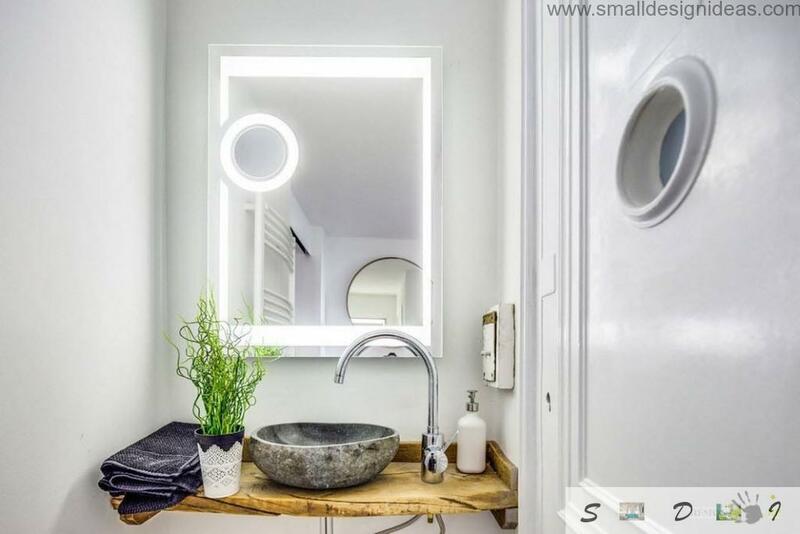 Mirror with unusual illumination brought element of futurism into the interior of a modest size bathroom. 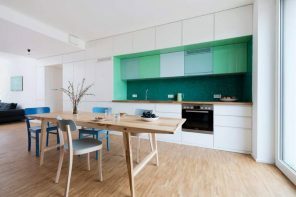 Some rooms of this German apartments have access to a spacious balcony, where originality and love for the bright decor items serves the owners of the apartment. What could be better than to breathe with fresh air and enjoy the excellent views of the surrounding nature, sitting on comfortable and bright seats?